WASHINGTON (CNN) -- A spending bill that funds the U.S. government for the rest of the budget year passed the Senate on Tuesday despite complaints about nearly $8 billion in what critics called "pork-barrel" projects. 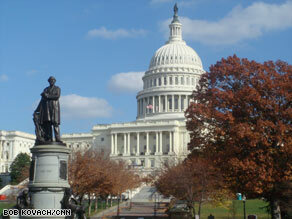 The Senate passes a bill to fund the government through the end of the fiscal year. Senators voted 62-35 to cut off debate on the $410 billion measure and passed it on a voice vote immediately afterward. The omnibus spending bill includes more than 8,000 congressional "earmarks," which total almost $8 billion. The earmarks have caused critics to question President Obama's pledge to end wasteful spending, but Obama administration officials said the bill is a holdover from the previous Congress. But Sen. John McCain, a longtime critic of congressional spending and Obama's Republican opponent in the 2008 election, said the vote shows "business as usual" remained the order of the day. "If the president were serious about his pledge for change, he would veto this bill. He won't," McCain said. The bill funds the U.S. government through September, when the 2008 budget year ends. Senate Majority Leader Harry Reid, D-Nevada, postponed the vote last week because he wasn't sure supporters had the 60 votes needed to break a potential GOP filibuster. Republican critics, led by House Minority Leader John Boehner of Ohio, have urged Obama to veto the bill because of the earmarks, targeted spending provisions inserted by Democratic and Republican lawmakers. The measure passed the House of Representatives last week. Senate Minority Leader Mitch McConnell on Tuesday called the bill a "missed opportunity." "In the midst of a serious economic downturn, the Senate had a chance to show it can impose the same kind of restraint on itself that millions of Americans are being forced to impose on themselves at the moment. ... If the president is looking for a first bill to veto, this is it," he said. McConnell has requested 36 "solo" earmarks -- those without cosponsors -- totaling $51 million in the bill, according to Taxpayers for Common Sense. The group said five senators have not requested any earmarks: Sens. Tom Coburn, R-Oklahoma; Jim DeMint, R-South Carolina; Russ Feingold, D-Wisconsin; John McCain, R-Arizona; and Claire McCaskill, D-Missouri. Some other senators have not requested any solo earmarks, but they have jointly requested funds with other lawmakers. Lawmakers on Monday night defeated an amendment from McCain that would have stripped the bill of most of its earmarks. White House spokesman Robert Gibbs said the president is planning to unveil new guidelines Wednesday aimed at cutting down on the number of earmarks that make their way into future appropriations bills. Gibbs said Obama may sign the spending bill into law behind closed doors rather than make a public show of it. He said the president will lay out the new guidelines on earmarks as a not-so-subtle threat that he could veto future spending bills that do not comply with his objectives. "Although it's not perfect, the president will sign the legislation but demonstrate for all involved rules moving forward that he thinks can make this process work a little bit better," Gibbs said. Gibbs added that "over the course of the president's tenure in Washington, dozens of those bills will come to his desk" and Obama wants to make clear "that there will be some new rules of the road" for lawmakers to follow. Top Democrats, including House Majority Leader Steny Hoyer of Maryland, have suggested lawmakers do not appreciate being dictated to on an issue that is a Congressional prerogative. Given the sensitivity of the issue with fellow Democrats, senior White House aides were reluctant Tuesday evening to preview any of the new rules the president will lay out for lawmakers. Aides would not specify whether the president would make public remarks about the new guidelines or release a written statement. CNN's Ed Henry, Sandra Endo, Ed Hornick, Kristi Keck and Brianna Keilar contributed to this report.